Most people, most of the time, take listening for granted, it’s something that just happens. It is only when you stop to think about listening and what it entails that you begin to realise that listening is in fact an important skill that needs to be nurtured and developed. Listening is perhaps the most important of all interpersonal skills and SkillsYouNeed has many pages devoted to the subject, see Listening Skills for an introduction. Further pages include The Ten Principles of Listening, Active Listening and Listening Misconceptions. Effective listening is very often the foundation of strong relationships with others, at home, socially, in education and in the workplace. This page draws on the work of Wolvin and Coakely (1996) and others to examine the various types of listening. 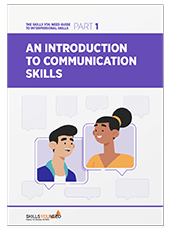 We hope that this page will be useful to both teachers – as teaching listening skills can be challenging – and also to students and other learners who are interested in developing their listening skills. Listening: the process of receiving, constructing meaning from, and responding to spoken and/or non-verbal messages. Discriminative listening is first developed at a very early age – perhaps even before birth, in the womb. This is the most basic form of listening and does not involve the understanding of the meaning of words or phrases but merely the different sounds that are produced. In early childhood, for example, a distinction is made between the sounds of the voices of the parents – the voice of the father sounds different to that of the mother. Discriminative listening develops through childhood and into adulthood. As we grow older and develop and gain more life experience, our ability to distinguish between different sounds is improved. Not only can we recognise different voices, but we also develop the ability to recognise subtle differences in the way that sounds are made – this is fundamental to ultimately understanding what these sounds mean. Differences include many subtleties, recognising foreign languages, distinguishing between regional accents and clues to the emotions and feelings of the speaker. Being able to distinguish the subtleties of sound made by somebody who is happy or sad, angry or stressed, for example, ultimately adds value to what is actually being said and, of course, does aid comprehension. When discriminative listening skills are combined with visual stimuli, the resulting ability to ‘listen’ to body-language enables us to begin to understand the speaker more fully – for example recognising somebody is sad despite what they are saying or how they are saying it. Imagine yourself surrounded by people who are speaking a language that you cannot understand. Perhaps passing through an airport in another country. You can probably distinguish between different voices, male and female, young and old and also gain some understanding about what is going on around you based on the tone of voice, mannerisms and body language of the other people. You are not understanding what is being said but using discriminative listening to gain some level of comprehension of your surroundings. Comprehensive listening involves understanding the message or messages that are being communicated. Like discriminative listening, comprehensive listening is fundamental to all listening sub-types. In order to be able use comprehensive listening and therefore gain understanding the listener first needs appropriate vocabulary and language skills. Using overly complicated language or technical jargon, therefore, can be a barrier to comprehensive listening. Comprehensive listening is further complicated by the fact that two different people listening to the same thing may understand the message in two different ways. This problem can be multiplied in a group setting, like a classroom or business meeting where numerous different meanings can be derived from what has been said. Comprehensive listening is complimented by sub-messages from non-verbal communication, such as the tone of voice, gestures and other body language. These non-verbal signals can greatly aid communication and comprehension but can also confuse and potentially lead to misunderstanding. In many listening situations it is vital to seek clarification and use skills such as reflection aid comprehension. Discriminative and comprehensive listening are prerequisites for specific listening types. Listening types can be defined by the goal of the listening. In reality you may have more than one goal for listening at any given time – for example, you may be listening to learn whilst also attempting to be empathetic. Whenever you listen to learn something, you are engaged in informational listening. This is true in many day-to-day situations, in education and at work, when you listen to the news, watch a documentary, when a friend tells you a recipe or when you are talked-through a technical problem with a computer – there are many other examples of informational listening too. We can be said to be engaged in critical listening when the goal is to evaluate or scrutinise what is being said. Critical listening is a much more active behaviour than informational listening and usually involves some sort of problem solving or decision making. Critical listening is akin to critical reading; both involve analysis of the information being received and alignment with what we already know or believe. Whereas informational listening may be mostly concerned with receiving facts and/or new information - critical listening is about analysing opinion and making a judgement. When the word ‘critical’ is used to describe listening, reading or thinking it does not necessarily mean that you are claiming that the information you are listening to is somehow faulty or flawed. Rather, critical listening means engaging in what you are listening to by asking yourself questions such as, ‘what is the speaker trying to say?’ or ‘what is the main argument being presented?’, ‘how does what I’m hearing differ from my beliefs, knowledge or opinion?’. Critical listening is, therefore, fundamental to true learning. (Also see our page: Critical Reading). Many day-to-day decisions that we make are based on some form of ‘critical’ analysis, whether it be critical listening, reading or thought. Our opinions, values and beliefs are based on our ability to process information and formulate our own feelings about the world around us as well as weigh up the pros and cons to make an informed decision. It is often important, when listening critically, to have an open-mind and not be biased by stereotypes or preconceived ideas. By doing this you will become a better listener and broaden your knowledge and perception of other people and your relationships. Empathic listening involves attempting to understand the feelings and emotions of the speaker – to put yourself into the speaker’s shoes and share their thoughts. (See our page: What is Empathy? for more information). Empathy is a way of deeply connecting with another person and therapeutic or empathic listening can be particularly challenging. Empathy is not the same as sympathy, it involves more than being compassionate or feeling sorry for somebody else – it involves a deeper connection – a realisation and understanding of another person’s point of view. Counsellors, therapists and some other professionals use therapeutic or empathic listening to understand and ultimately help their clients. This type of listening does not involve making judgements or offering advice but gently encouraging the speaker to explain and elaborate on their feelings and emotions. Skills such as clarification and reflection are often used to help avoid misunderstandings. (See our further pages: What is Counselling?, Clarification and Reflection for more information on these topics). We are all capable of empathic listening and may practise it with friends, family and colleagues. Showing empathy is a desirable trait in many interpersonal relationships – you may well feel more comfortable talking about your own feelings and emotions with a particular person. They are likely to be better at listening empathetically to you than others, this is often based on similar perspectives, experiences, beliefs and values – a good friend, your spouse, a parent or sibling for example. Appreciative listening is listening for enjoyment. A good example is listening to music, especially as a way to relax. (See our page: Music Therapy for more about using music as a relaxation therapy). When trying to build rapport with others we can engage in a type of listening that encourages the other person to trust and like us. A salesman, for example, may make an effort to listen carefully to what you are saying as a way to promote trust and potentially make a sale. This type of listening is common in situations of negotiation. (See: Building Rapport and Negotiation Skills for more information). This is a more negative type of listening, it implies that the listener is somehow biased to what they are hearing. Bias can be based on preconceived ideas or emotionally difficult communications. Selective listening is a sign of failing communication – you cannot hope to understand if you have filtered out some of the message and may reinforce or strengthen your bias for future communications.